Bariatric Services is the biggest bariatric surgery centre in the Baltic region, Finland and north-western Russia. Our medical team is highly experienced in the field of bariatric surgeries and improves its skills continuously in order to provide top-quality medical service for our patients. Excellent training and extensive experience has brought the occurrence of complications to a minimum. We have greatest expertise in Estonia in complex revision surgery and in treating high risk surgical patients. Our surgical team has performed more than 2000 bariatric surgeries and is highly experienced in the field of bariatric surgeries. Excellent training and extensive experience has brought the occurrence of complications to minimum. 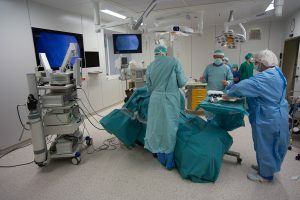 Surgeries are performed in North Estonian Medical Centre which is the highest level medical centre in the region, capable of handling most challenging and complicated medical cases. Our surgeons and anesthesiologists have excellent training in bariatrics and have very good experience in treating high-surgical-risk bariatric patients. Surgeon and dietician online consultation available for long term. Skype consultations are growing in popularity for our patients as they enable both the patient and the doctor to communicate directly with each other without having to travel.